We had a great visit this morning with a group of creative minds from Bath & Body Works. They are touring Bucks County so they stopped by Canal House Station to see what we are up to and to grab a bite of breakfast. What a fun confab. We were asking them questions, “What are your favorite fragrances?” And they were asking us questions, “What are your favorite flavors?” We were all interested in each other’s point of view. They were on a schedule, so we showed them around the building, then fed them—waiting to eat later since we were the waitresses. 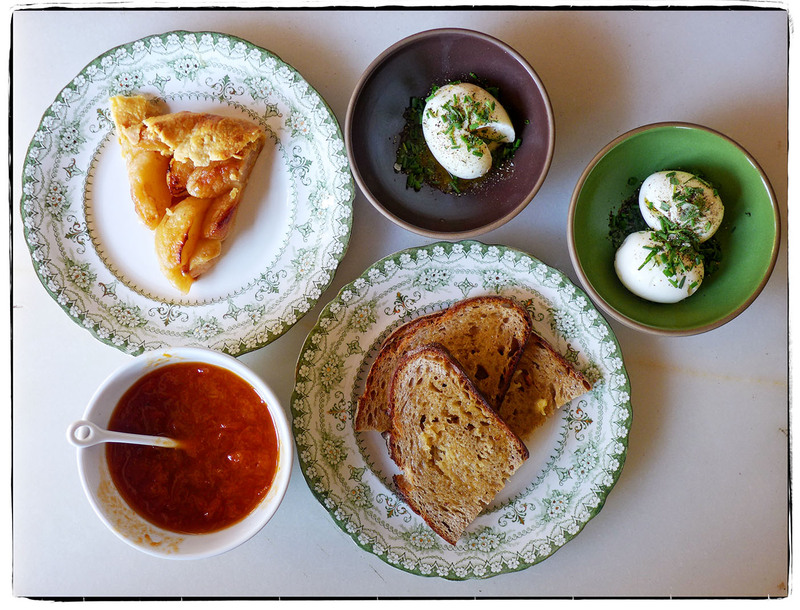 We finally sat down around 2 P.M. to a breakfast lunch of buttered soft boiled eggs showered with tarragon and chives, toast with apricot jam, and the last piece of apple galette to share. Actually the day was about sharing. Everybody wins.